Editor’s note: Trends and consumer preferences in international student mobility naturally intermingle with those in the travel sector and so ICEF Monitor maintains a watching brief on important issues and emerging marketing strategies in global travel. We present a special two-part series on the use of technology in travel marketing – please see part one below and then continue to Part Two. There’s no denying that today’s consumers are “always on.” Having 24-7 access to the web has heightened the average consumer’s expectations for service, and these expectations extend through the full life cycle of a consumer’s journey. Consumer expectations were a hot topic at this year’s Travel Technology Europe (TTE) event, held in London last month and attracting over 4,500 professionals specialised in travel technology. Expert speakers offered insights into the latest trends and innovations, while attendees were abuzz with questions, most of which boiled down to two main issues: how much personalisation do today’s consumers want and what kinds of technology is being used to meet or exceed their expectations? “Personalisation – both in targeted, relevant communications and with respect to travel services and products. Fast feedback from brands when a query is raised or there is a problem. Seamless cross-device and cross-platform experiences and interactions. But how does a company achieve this seamless customer experience? Certainly technology can help, but many companies are dealing with legacy systems which aren’t set up to adapt to today’s innovative digital world. Other companies are juggling too many third-party providers whose systems can’t talk to each other. Understanding your customer and tailoring your products or services to suit their needs is surely one way to create that uniform and fluid experience. But first you must learn more about your customer, which requires earning their trust and proving to them that the benefits outweigh the risks or time needed to share information. And here’s where the challenge of personalisation comes in. Our expectations for better service have gone way up, way beyond privacy concerns. Leaving us to wonder, have our expectations of good service superseded our concerns about privacy? Opinions are divided on the amount of information people are willing to share in exchange for greater levels of personalisation. On the one end, the BioTrends report reveals, “The argument for the data value exchange is still not convincing. When asked about the trade-off of sharing personal information with a brand ‘in return for a highly personalised experience,’ only 3% of the poll said this was ‘highly desirable’ while 44% were in the ‘not sure’ camp. Whereas at the other end of the privacy spectrum, “almost two thirds’ of consumers aged between 18 and 34 ‘don’t care about privacy‘, with 59% of those aged between 35 and 44 equally unconcerned,” according to a 2013 report from research firm Coleman Parkes. And how well are we doing so far? An analysis by Alix Arguelles, Vice President for the Online Travel Group at Amadeus North America endeavoured to determine how successful the travel industry has been with personalisation so far, and it appears there is plenty of room for improvement. 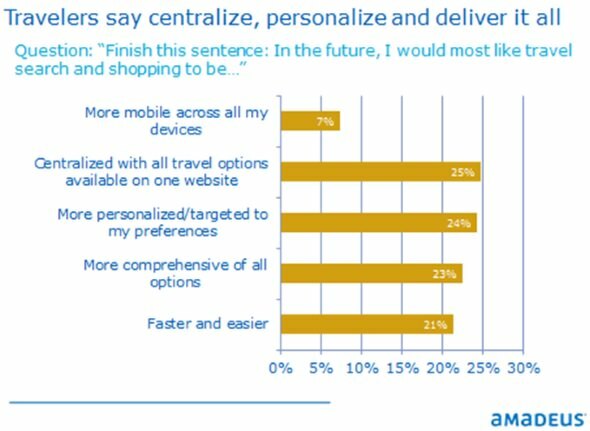 “Respondents want their future travel search and shopping experience to be more centralised (25%), personalised (24%) and comprehensive (23%).” The author points out that these needs superseded that of being able to search and book trips on mobile devices, suggesting that instead, providers should concentrate on delivering solutions across all platforms. Satisfying consumers’ preferences throughout each stage of the customer life cycle – acquisition, conversion, and retention – is certainly key. Personalisation and a seamless experience are two ways to achieve this. Another is differentiation. Standing out in a crowded marketplace appears to be one of the biggest challenges for providers today. Ultimately it’s all about value. The more value you offer and the better you can promote it, the more you will stand out. Please continue to part two of our series, where we show you some impressive examples of how brands are differentiating themselves through the use of the latest technology. This entry was posted in Africa, Asia, Australia/Oceania, Europe, Middle East, North America, Regions, Research, South & Central America, Technology, United Kingdom, Youth Trends and tagged primary schools abroad, backpackers marketing, language schools, youth trends, European Union student recruitment.